Do you believe in magic? I know I do. 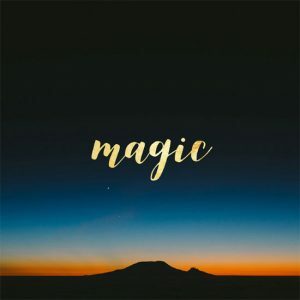 When I speak of magic I am using it in the sense of wonder, fascination, that flutter of excitement that can come from the unexpected which can be captivating and enchanting. To capture the so-called naivety of youth. Is it actually the ability to stop, to stare, to allow? To be truly present and experience all the wonders of life. Right here, right now. Not at some distant juncture when we have enough time, money or – fill in the gap with your own personal set of reasons why you can’t today. Today is a good day to make a start. Today is a very good day to make a change. To choose to see magic where perhaps you perceived the mundane before. If you don’t know how, if you’ve forgotten, think back to your childhood or be inspired by your own children. Just allow yourself some space that’s all it takes. A little bit of space to let the magic in. It was there all along. It’s just we’ve been so busy, being busy, doing things, filling our life, our time with stuff that we have forgotten about it. We have forgotten that sometimes the best thing we can do is pause, look around us, and allow ourselves to see. To really see and experience that magic that never went away. Just like Peter Pan. Why did Peter Pan not want to grow up? Was it because he was afraid he would lose sight of the magic? Well the good news is you can grow up and still have magic in your life. Perhaps it’s time to recapture that sense of youth and innocence. To embrace your inner child. To have more fun and play again. We can all bring a sense of fun and playfulness in to most everything we do. It’s our choice.